Sir John A. Macdonald, Canada's first prime minister, said the Senate was to be a place of sober second thought so that legislation would receive careful consideration before becoming law. The Parliament of Canada has two houses, the elected lower house, known as the House of Commons, and the appointed upper house, known as the Senate. Both houses are involved in the passing of legislation. Sir John A. Macdonald, Canada's first prime minister, said the Senate was to be a place of "sober second thought" so that legislation would receive proper, careful consideration before finally becoming law. Although members are currently appointed, Prime Minister Stephen Harper has often said his intention is either to transform the Senate into an elected body or abolish it altogether. Canadian federal legislation must pass through both houses. Legislation is introduced either as public bills, which deal with public policy, or as private bills, which deal with specific needs. Both houses can generate legislation, although the majority of public bills in Parliament come from the House of Commons. Private bills confer special rights or powers on an individual or particular group. The Senate cannot introduce money bills, meaning bills that collect or spend public funds. If introduced by the House of Commons, a bill is designated with a C. If introduced by the Senate, it is designated with an S.
Both houses must approve legislation separately, although the process for both follows the same stages. The steps in the federal legislative process are: first reading, second reading, committee stage, report stage, third reading, referral of the bill to the other house, passage through the other house, then royal assent from the Governor General. The last stage signals the bill's passage into law. If there is not agreement on a bill's contents, amendments are made, discussed and voted upon until there is agreement. There are 105 senators and they come from such fields as business, law, education, public service and journalism. Some worked previously as civil servants, some used to be cabinet ministers, some are former party leaders. Under the Constitution, four or eight extra senators can be appointed on a temporary basis, but this power has only been used once, by then prime minister Brian Mulroney in 1990 to ensure passage of the goods and services tax. By contrast, there are 308 MPs. The federal government estimates that the cost of the Senate is about one-fifth that of the House of Commons. All 10 provinces and three territories are represented in the Senate. Alberta, in particular, has agitated since the early 1980s for an elected upper house, which would mean the provinces would have the power to decide their own Senate representatives. Starting in 1989, Alberta has held three votes to nominate "senators-in-waiting," though the results are non-binding on the appointment process. Nevertheless, two of the successful candidates have been named to the upper chamber, Stan Waters in 1990 on Mulroney's recommendation and Bert Brown in 2007 on the recommendation of Harper. Saskatchewan passed similar legislation in 2009. In December 2006, Prime Minister Stephen Harper tabled legislation called the Senate Appointment Consultations Act, which called for Canadians to vote for "preferred" Senate candidates in their provinces or territories. The bill died before second reading when the parliamentary session ended the following autumn. The government reintroduced a version of the legislation in November 2007, but it, too, died before second reading, this time when the fall 2008 election was called. Currently, the Governor General appoints senators based on recommendations made by the prime minister. To be a senator, you must be a Canadian citizen, at least 30 years of age, own $4,000 of equity in land in your province, have a personal net worth of $4,000, and live in the province that you plan to represent. The "net worth" requirements, however, do not stand in the way of ordinary Canadians being appointed to the Senate. In 1997, it was determined that the average age in the Senate was 64, while it was around 52 in the Commons. Senators are not required to retire until they reach the age of 75. The federal government estimates that there is a complete turnover in the Senate every 17 years, ensuring continuity for the sober second look at bills. 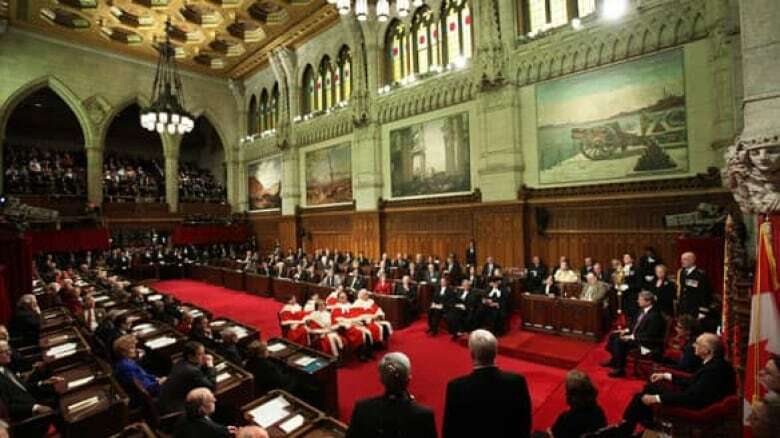 In May 2006, Harper introduced Bill S-4, which proposed to limit terms for new senators to eight years. The legislation died before it could pass, as did two reiterations of the bill in subsequent parliamentary sessions. A revived, fourth version of the bill received first reading in the House of Commons in March 2010. The bulk of work done by the Senate is committee work. Senator Muriel McQueen Fergusson, the first woman Speaker of the Senate, said committees are the "heart and soul of the Senate" because committees discuss important social, economic and political issues and this forum is where senators hear from interested citizens. Most bills, prior to third reading, are referred to committees where they are examined closely. In the Senate committee stage, public hearings are held, the bills are studied clauses by clause, and a report on the bill is prepared and presented to the Senate. Committees, which function as study groups, include 12 to 15 senators. Both houses of Parliament can pass, amend, delay or defeat bills. Senators do not usually delay or defeat legislation already passed by MPs, but they can reject bills and they will. If the Senate decides the government of the day does not have a mandate to do what it proposes, or a bill is not good legislation because it is misguided, based on wrong information or not in the public interest, it will bring the legislative process to a halt. If the Senate defeats a bill, that usually means the government has to go back to the drawing board. In 1988, the Senate made national news when it delayed Bill C-130, the bill that proposed to implement the free trade agreement between Canada and the United States. The government called an election on the issue, and when it swept back into power, it introduced a similar bill that passed both houses quickly. In the 1990s, the Senate defeated four bills: Bill C-43 on abortion, Bill C-93 on the streaming of federal boards, agencies, commissions and tribunals, Bill C-28 on the Lester B. Pearson International Airport in Toronto, and Bill C-220 on profiting from authorship with respect to a crime. In July 2010, the Senate made countrywide headlines again when its finance committee voted to amend the goverment's budget-implementation bill by excising four major parts dealing with Canada Post, Atomic Energy of Canada Ltd., excise taxes and environmental assessments. Conservative Senator Doug Finley said the government was "ready to go to an election" to uphold the original legislation. The Senate is known as the Red Chamber because it's a large room with red carpeting. It is ornate, it has carved oak panelling, and it contains eight large oil paintings that portray scenes from the First World War. It is the stage for important state ceremonies and that includes the opening of Parliament and the speech from the throne. The Senate has been criticized as being a waste of public resources, a rubber stamp, not accountable, and a comfortable place for aging politicians, but according to its original design, it provides checks and balances for Canada's parliamentary system.